HTC Desire 510 smartphone was launched in August 2014. The phone comes with a 4.70-inch touchscreen display with a resolution of 480x854 pixels. 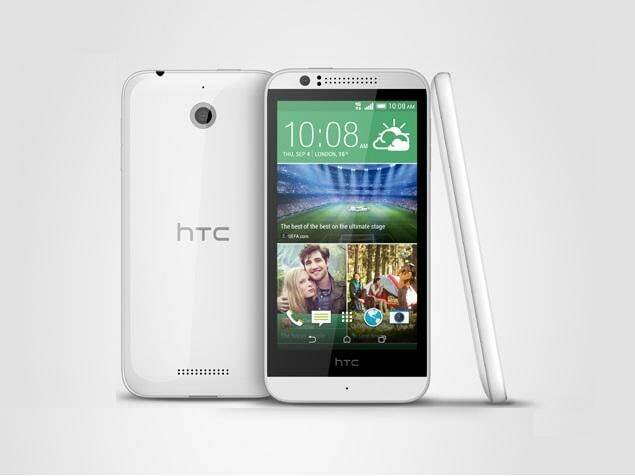 HTC Desire 510 is powered by a 1.2GHz quad-core Qualcomm Snapdragon 410 processor. It comes with 1GB of RAM. The HTC Desire 510 runs Android 4.4 and is powered by a 2,100mAh removable battery. As far as the cameras are concerned, the HTC Desire 510 on the rear packs 5-megapixel camera. It sports a 0.3-megapixel camera on the front for selfies. The HTC Desire 510 runs Sense 6.0 based on Android 4.4 and packs 8GB of inbuilt storage that can be expanded via microSD card (up to 128GB). The HTC Desire 510 is a single SIM (GSM) smartphone that accepts a Micro-SIM card. Connectivity options on the HTC Desire 510 include Wi-Fi 802.11 b/g/n, GPS, Bluetooth v4.00, FM radio, 3G, and 4G. Sensors on the phone include accelerometer and proximity sensor. The HTC Desire 510 measures 139.90 x 69.80 x 9.99mm (height x width x thickness) and weighs 158.00 grams. It was launched in Terra White and Meridian Grey colours. As of 23rd April 2019, HTC Desire 510 price in India starts at Rs. 10,957. JUNE 28, 2015 TiIME: 8:35pm BOOST MOBILE HTC DESIRE 510 CELLPHONE I AM BEGINNING TO HATE THIS “BOOST MOBILE” HTC DESIRE 510 CELLPHONE THAT I BOUGHT WITH THEIR MONTHY UNLIMITED TALK, TEXT, & DATA. 1. ON THE HOME SCREEN THERE IS A LOCK AND THE ICON LOCKS WITHOUT YOU LOCKING IT AND YOU CAN NOT ACCESS YOUR CELLPHONE! 2. WHEN YOU ACCESS YOUR CELLPHONE FROM THE HOME PAGE, IT ALWAYS TAKES YOU TO A WIFI HISTORY! 3. YOU ALSO HAVE DIFFICULTY MAKING CALLS AND PEOPLE CAN BARELY HEAR YOU TALKING! 4. YOU HAVE DIFFICULTY WITH THE VOLUME CONTROLS ON THE CELLPHONE! 5. THE SPEAKER BUTTON MUFFLES THE CALLS, YOU CAN BARELY HEAR THE PERSON TALKING AND THEY CAN BARELY HEAR YOU! 6. WHEN YOU SEND TEXT MESSAGES, THE KEYS ARE SO SMALL THAT YOU CAN NOT TEXT. YOU TEXT WORDS THAT YOU HAVE NOT CHOSEN AND IT SEEMS THAT THE CORRECTION UNDERLINES CONSTANTLY IN RED. ALSO, WHEN YOU TYPE TEXT MESSAGE WORDS THAT ARE CORRECT, UNDERLINES AS NOT CORRECT! 7. THIS CELLPHONE ALSO HAS NO AUTO-WORD ON IT! 8. WHEN TRYING TO TEXT YOU ARE CONSTANTLY PROMPTED TO MAKE CALLS INSTEAD OF TEXTING! THIS IS NOT A GOOD CELLPHONE TO PURCHASE UNLESS YOU WANT TO HAVE MAJOR PROBLEMS WITH SIMPLE FUNCTIONS!